____________ and ____________, what a marvelous day this is for us! In this moment we have come to stand by you as, in the presence of our Lord, you experience one of the most precious and important events of your life -- your wedding. We are here to assure you that because we love you, we will pray for you and support you as you go out from this place. For we know that happy weddings are a dime a dozen; happy marriages are rare. 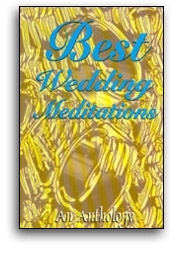 Unfortunately, there are no self-help books, no "Ten Steps to Marital Bliss" which can ensure a strong, joyous marriage.